As you maybe know after the lady speed stick article I’m still looking for the perfect solution against sweating. And for sure now that the temperatures are raising. So time to fight the sweating problem! I’m for sure still a fan from lady speed stick, but now I was looking for a good natural replacement. So during my search I found this special grey deo, the guv’ner from lush. We all know the classic spray and roll deo. But I never saw a powder deo before! So I was directly interested when I saw this the guv’ner deo powder. It has a gray color because of the powdered charcoal inside. Charcoal inside has an absorbing function, for the rest contains this deo also lycopodium, calamine and lavender powder. You can bring on the powder with an old makeup brush or just with your hands. So let’s start with saying that such a powder deo is not easy to bring on. Or I bring it on with my hands or a makeup brush it’s difficult to not spill some powder. Or I spill it or not the powder also makes some spots. So you can best bring this on before you are dressed. And don’t use this when you are wear white or light clothing. Because then you will get some grey spots, unfortunately! But when you aren’t wearing light clothing there is no problem. This deo smells a bit like the charcoal and it has something male. This deo is mainly for men’s, but for woman is it also ok! 😉 Because I really love the smell, but after bringing it on you barely can smell it. This deo kept my armpits fresh and dry for the whole day! But I didn’t test this when it’s too hot because then I’m afraid for the stains. But for normal warm days is this perfect! I don’t get any sweat stains and I’m feeling fresh to whole day! This deodorant powder works for sure and protects me during the day. Buuut there are some negative things about it… First it is a bit difficult to bring this powder on. And it also makes stains on lighter clothing so I’m not using this deo with warmer weather. It’s also a pricey deo, but it’s a frugal product! I will still use this deo, but I’m not buying this one again. 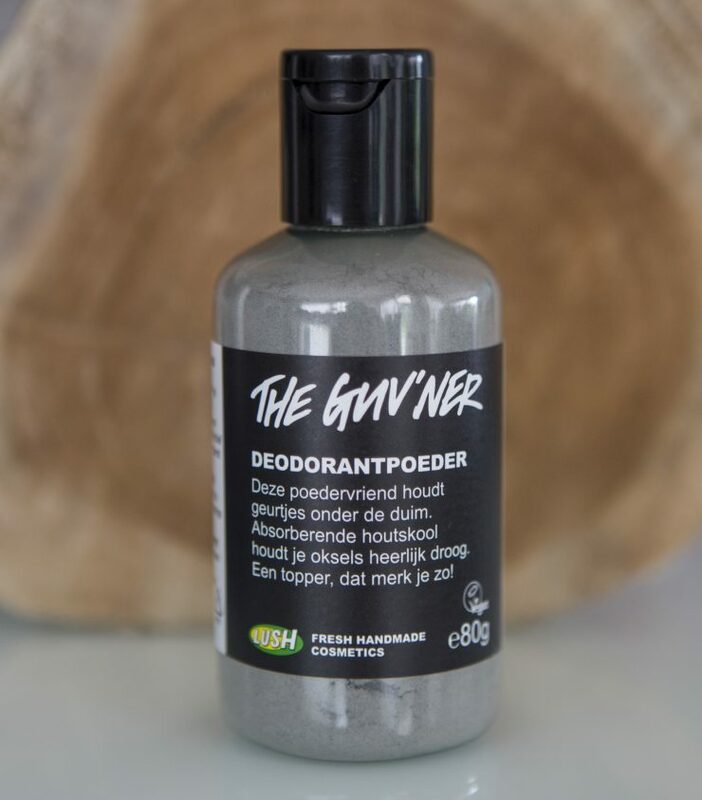 Lush the guv’ner deodorant powder contains 80g and cost €11,45. Dit product is me nooit opgevallen bij Lush, toch maar eens proberen!